How does a filmmaker who so denigrates documentary as does Werner Herzog become one of its most innovative and challenging practitioners? That and many other questions regarding this provocative, prolific filmmaker, are answered by Eric Ames in his new book, Ferocious Reality: Documentary According to Werner Herzog. Given that Ferocious Reality is part of the venerable Visible Evidence Series edited by esteemed scholars Michael Renov, Faye Ginsburg and Jane Gaines, I approached the book with some degree of trepidation, fearing it might be so fraught with jargon and postmodernist theorizing as to be inaccessible to a general interest audience. But not long into the first chapter, I began to relax and enjoy this most excellent exploration of Herzog's engagement with cinema in general and documentaries in particular. Eric Ames is an associate professor of German as well as a member of the cinema studies faculty at University of Washington. I felt this background gave additional weight to his authoritative voice in helping us engage with one of the most controversial filmmakers of our time. This is a brave book. You can't be wimpy when dealing with a subject as confrontational as Herzog. Ames opens the book with Herzog's "Minnesota Declaration," the 12-point manifesto that the filmmaker "performed" in front of a packed theater at the Walker Art Center in Minneapolis in 1999, to open a public dialogue with film critic Roger Ebert. It was Herzog's way of "throwing down the gauntlet" at the feet of those filmmakers who espouse cinéma vérité as the only road to "truth" in documentary film. Herzog has long bemoaned the limiting nature of cinéma vérité and often targeted for ridicule those most closely associated with its ascension: Richard Leacock, DA Pennebaker, Robert Drew, Albert and David Maysles, among others. 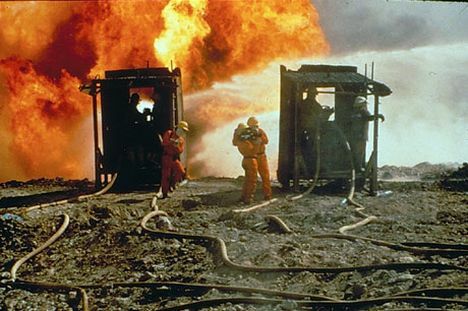 Ames suggests that we focus on Point Five in the manifesto, as it holds a key to understanding Herzog's approach: "There are deeper strata of truth in cinema, and there is such a thing as poetic, ecstatic truth. It is mysterious and elusive, and can be reached only through fabrication and imagination and stylization." Over the course of his career, from 1962 until the present, Herzog directed over 60 films. Despite his open rejection of the definitions of "documentary" as we have come to know it, approximately half of his titles are indexed as documentaries. It is this ambivalent and often contradictory relationship of Herzog to documentary cinema that is at the heart of this book. This contradiction is evident in Herzog's objection to, and simultaneous appeal, of documentary's "privileged relationship to knowledge." Herzog sees himself as a poet and an artist, not a documentarian, which also seems to reflect the attitude of ethnographic filmmaker Robert Gardner (Forest of Bliss; Dead Birds), who founded the Film Study Center at Harvard. It is interesting that Lucien Taylor (Sweetgrass; Leviathan), who took over as director of the center upon Gardner's retirement, seems to be pursuing a path that Herzog would most approve of, with the establishment of the Sensory Ethnography Lab, a place where those students of observational cinema can explore what Herzog and others call the "ecstatic" as well as the sensual nature of filmic "truth." The theme of performance is one of the organizing concepts used by Ames for the study of Herzog's work. 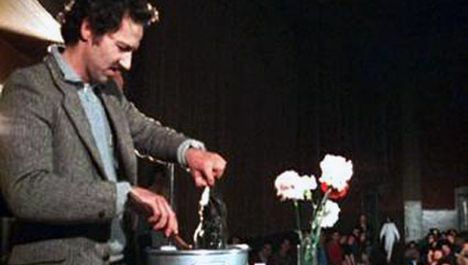 My own, first encounter with Herzog was via a "performance"-that of his appearance in Werner Herzog Eats His Shoe, the 1980 film by Les Blank featuring the German director doing exactly what the title says. It was Herzog's way of making good on a bet to eat his shoe if/when Errol Morris, then a graduate student at Berkeley, completed his first film, Gates of Heaven, which Morris did in 1979. It was clear to me at the time that Herzog relished the opportunity to play this role and this was, as Ames points out, just one of the many opportunities for Herzog to act out his own "directorial persona" in a documentary made by another filmmaker. The seven chapters of the book focus on an analysis of 28 Herzog films, several of which were previously unknown to me. They are not ordered chronologically, but rather issues and themes that weave their way through Herzog's oeuvre become the threads that tie the films to Herzog and Herzog to the documentary genre. Chapter One focuses on questions of corporeality primarily by examining two films: Land of Silence and Darkness (1971) and the ethnographic film Wodaabe: Herdsmen of the Sun (1989). This chapter also provides some insight into Herzog's engagement with television. Landscape is an oft-appearing trope in films such as Fata Morgana (1971), La Soufriere (1977), Lessons of Darkness (1992) and Wheel of Time (2003). Chapter Two explores the treatment of landscape to elicit a sense of place and space in the aforementioned films. Subsequent chapters cover Herzog's fascination with pilgrimage, as experienced in a long-distance physical journey; various manifestations of the baroque, both sacred and secular; politics; the revision of Herzog's own cinematic past; historical reenactment as a documentary technique; and lastly, in Chapter Seven, questions of subjectivity, identification and self-reflection. While the book was rich with insightful reflections, I found Chapter Seven the most revealing. It is here where we see the evidence that most of Herzog's work is autobiographical, as he pointedly states in I Am My Films: A Portrait of Werner Herzog, a 1978 film that he co-opted from the directors Christian Weisenborn and Erwin Keusch for his own intentions. More complex is his fascinating, love/hate relationship with two of his film's protagonists-the actor Klaus Kinski (My Best Fiend; 1999), who is best known for his appearances in Herzog's feature films (Aguirre, Nosferatu, Woyzeck, Fitzcarraldo and Cobre Verde); and Timothy Treadwell, the amateur filmmaker and wildlife preservationist whose self-recorded life among grizzly bears in Alaska was appropriated by Herzog for his own ends in Grizzly Man (2005). It is as though Ames started with a whole onion, and gradually peeled away the skin, layer after layer until some sort of essence of the thing becomes clear and sharp for all to see and know. What a profoundly difficult undertaking by this author. 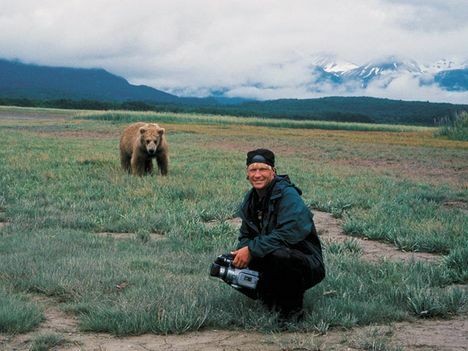 In the book's conclusion, Ames covers the last six years of Herzog's excursions in documentary film. Encounters at the End of the World (2007) and Cave of Forgotten Dreams (2010) are reminders that "much of Herzog's work in documentary can be described as a multisensory translation project, a creative endeavor to render visible what is often presumed to elude observation." While he may be the most influential filmmaker whose work is not included in many major studies and histories of documentary, we can thank Eric Ames for correcting this oversight by being a most capable translator of the documentaries of Werner Herzog.